mfb wrote: The BCMS scheme now reliably delivers 120% design luminosity. Also a noticeable improvement in initial beam life time from 5 to 7 hours, giving an incredible 100\fb over just 2.5 hours. Fingers crossed they may even take it to 130%, but the current problem with cryogenics might be a sign of this being too unreliable in the long run. There is also the statistics page which is linked on the portal. But a luminosity plot for a particular fill rather than over the last 24 hours. I don't think 120% is the best they can achieve. And heat load tends to go down over time. Edit: time lapse of the LHC lumi screen for 24 hours. The turn around time decreased now to 3 hours, great!! In the morning meeting slides are some curves for optimal fill length for 4h and 5.8h TAT for different fills. An always optimum length has not much benefit. Between 8-25h the curve is nearly flat. There is much loss by long TATs or fills shorter than 8h. Performance has been worse since the MD block, lower time in stable beams and the initial luminosities are lower as well. We'll probably get some improvement from the increased number of bunches soon. Recorded integrated luminosity/week ~1.6fb compared to ~2.5fb before the MDs which still looks pretty good, considering that there was even talk of replacing magnet D that would have taken 8 days, plus a few hundred hours of intensity ramp up. I wonder how much of the recent MD will be used over the coming weeks to improve performance? The number of bunches went up for this run (2174), the luminosity improved only marginally. On the other hand, we have this weird ATLAS/CMS discrepancy, no idea which value to trust for overall normalization. “In a bad accident, the beam could go off course and drill a hole through one or two magnets,” says Schmidt. While this would not destroy the LHC, it would still require time and money for repair. Replacing a dipole magnet, for which CERN has 30-40 spares, would take 30 days. A more complicated repair, or replacement of a less common component, would take longer. Fingers crossed it isn't this serious. It is an electric problem - the beam drilling a hole through the magnet would look differently. Here is the last beam as it arrived at the beam dump (the image will change once they have the next dump, but then the problem has been fixed). mfb wrote: It is an electric problem - the beam drilling a hole through the magnet would look differently. PS vacuum issue: no beam from PS until tomorrow. The observations could be explained with a model in which an inter-turn short is included. • No signs of a (change in) inter-turn short observed in the cycles performed on 10/11 Aug 2016 and FPA tests at 760 A. Short might permanently be present (or not), but seems ‘stable’. • A quench at high current in a magnet with an inter-turn short will destroy the magnet. • Possibly a FPA at high current causes significant voltage on a magnet with an inter-turn short, resulting in a QPS trigger and subsequent heater firing, which will then also destroy the magnet. • CONCLUSION: For operation in presence of an inter-turn short, we should reduce as much as possible the probability of a quench of magnet A31L2 as well as the probability of a FPA in sector 12. 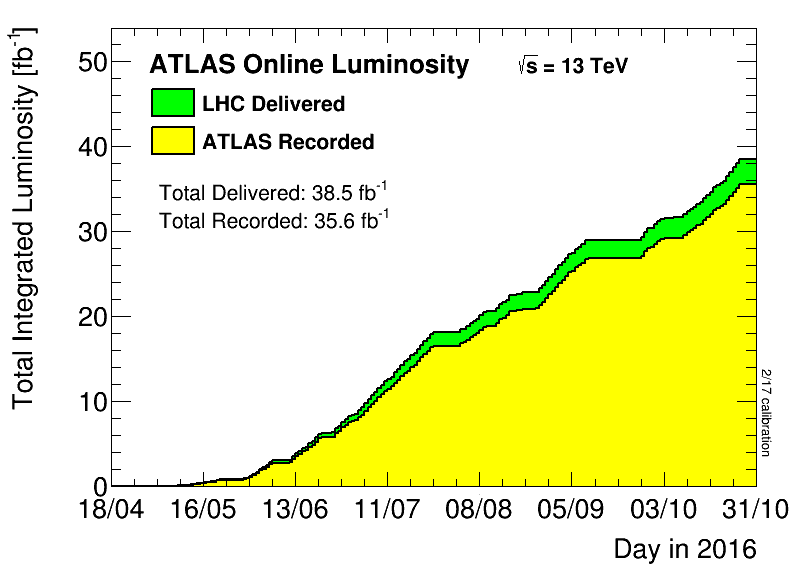 For now the LHC is running again, initial luminosity this morning was a bit above the design luminosity. Progress has been a bit slower the last weeks, but we are surpassing the initial integrated luminosity goal for this year these days. ATLAS shows 24/fb, CMS shows 27/fb, at least one calibration is off. 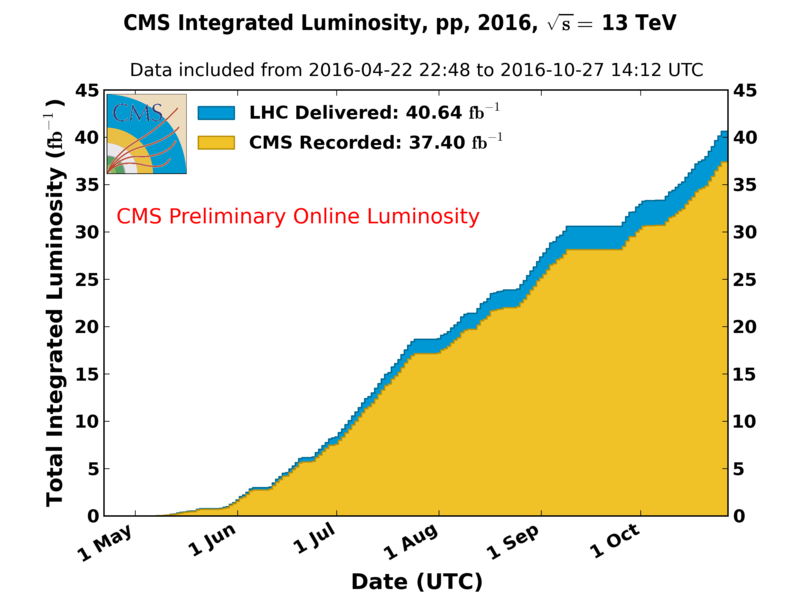 New record for instantaneous luminosity for CMS at ~13.5 hz/nb ! and it's back to averaging 2.5\fb/week as in early August. But it's difficult to know how much out of calibration CMS is, and whether the record is real. "Between 27 and 29 inverse femtobarn" is probably a reasonable guess for the dataset so far. In the schedule we have ~5 weeks more data-taking. Maybe 4-4.5 if we include two ramp-ups after TS2 and MD4. Looks like 35-40/fb by October 25th. Combined with the 2015 dataset, LHCb should have a bit more B- and C-hadrons than in run 1 now.